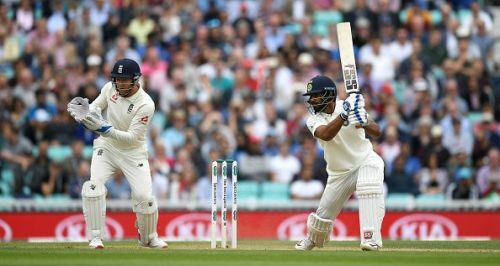 One of the biggest takeaways for India from the ongoing Test series against England is the performance of middle-order batsman Hanuma Vihari on debut. Vihari, who was handed his Test cap before the start of the fifth Test at The Oval in England, scored 56 in India's first innings and stitched together a crucial 77-run partnership with Ravindra Jadeja for the seventh wicket that helped India reduce the deficit. It was not about the runs he scored in the innings but it was about the way he got his runs as he was under immense pressure in the third session of day 2 where the ball was swinging a lot for the fast bowlers under lights. He was nervous early on, something that one can understand as it was the first time he walked out to bat in international cricket, had luck on his side and somehow managed to weather the storm on day 2. On day 3, he was batting like the Hanuma Vihari, who averages around 60 after playing 61 first-class matches as he looked at ease, stamped his authority on the bowlers and reached his 50 on Test debut. Unfortunately, he was given out on 56 and since the third umpire did not have any evidence to overturn the decision, he went with the on-field call. Talking about his knock at the end of the day, Vihari credited Indian captain Virat Kohli as he helped Vihari by giving some inputs and made his job easier when he was under immense pressure late on day 2. "Initially I felt the pressure, to be honest, going in yesterday, cloudy conditions and Stuart Broad and (James) Anderson bowling at you. Initially, as I said, I had nerves. With that, I wasn't good with my decision making. But having Virat [Kohli] at the other end made my job a little easier, I guess. His inputs helped me initially. He's been playing very confidently throughout the series and his confidence boosted me at the other end. I will give a lot of credit to him for helping me out yesterday initially. But once I settled down, the wicket was very good to bat on especially with the medium pacers it got a lot slower yesterday. I got myself in and tried to capitalise as much as I could," Vihari said. With this, Vihari has made sure that he cemented his place in the Indian side that will be touring Australia later this year and will look to continue his rich vein of form if he gets a chance down under.